INDIANAPOLIS — The next generation of NFL signal callers just flew into town on Wednesday. They won’t work out until Saturday, but the frantic search for quality quarterbacks is the biggest agenda item as teams descend on Indianapolis for the NFL combine. With the combine ending the day before the legal tampering period of free agency begins, the next week or so is the time for teams with a glaring need at quarterback—Cleveland, the Jets and the entirely quarterback-less 49ers among them—to chart a plan for the most important position on the roster. That can happen in the interview rooms or back-channel meetings with agents or other teams. 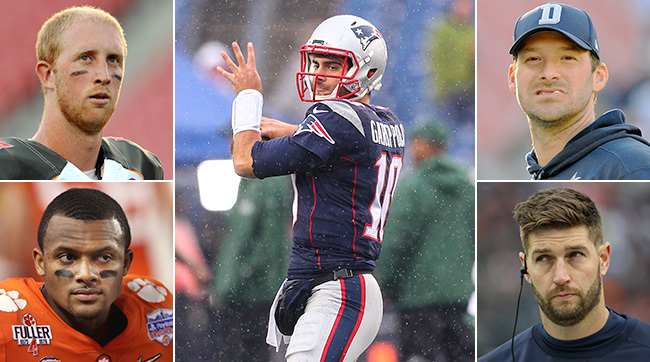 The biggest domino in this offseason’s quarterback sweeps is Patriots back-up Jimmy Garoppolo. The MMQB’s Peter King has written for a few weeks that he’d be surprised if the Patriots traded Tom Brady’s back-up, and Wednesday morning, ESPN’s Adam Schefter reported that Garoppolo will not be dealt, at any price. If that holds true, and if the Patriots truly can’t be swayed by a package like a first- and a third-round pick from a very interested team like the Browns, that will be a sea change for the quarterback marketplace. 1) Another young back-up with a small set of starting experience, like Mike Glennon (a free agent) or AJ McCarron (under contract for one more year in Cincinnati). If you’re the Browns, good luck getting Mike Brown to trade McCarron within the division. 3) Draft a quarterback. Top prospects Mitch Trubisky (North Carolina), DeShone Kizer (Notre Dame), Deshaun Watson (Clemson) and Patrick Mahomes (Texas Tech) all have talent but flaws that cast doubt on whether any of them can be a Day 1 starter. That last option might be the best one. Think the Eagles in 2016. They triple-downed on quarterbacks, extending Sam Bradford, adding Chase Daniel in free agency and trading up in the draft to nab Carson Wentz. They then recouped some draft capital back by trading Bradford to Minnesota at the start of the season. The idea: There’s no more important position on the field than quarterback, so give yourself as many options as possible so you’re not left out in the cold. We’re a week from free agency opening, and two months from the draft, but this much is for certain: The conversations in Indianapolis over the next few days will set the course for how the QB dominoes fall in 2017. 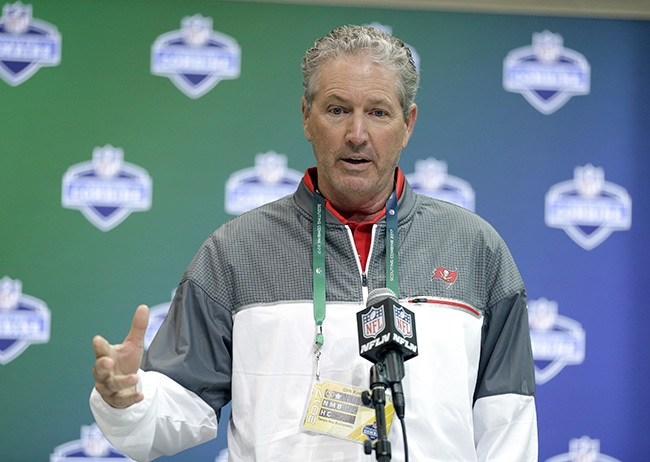 Bucs coach Dirk Koetter used his time with the media to defend Jameis Winston. Koetter seemed rankled about the scrutiny of his quarterback’s words. He defended Winston, but didn’t give any indication, at least publicly, of if or how his player might have learned from the situation. “Anyone who knows Jameis Winston knows that when Jameis gets up in the morning, he’s trying to do good things out there, whether it be improve himself, help our team get better or do something good in the community,” Koetter said. “In the midst of a school presentation, he made a mistake and he owned up to that mistake. He’s 23 years old. I think anyone who has to stand behind a microphone and talk to a group of people, you’re going to make mistakes from time to time and there’s been other ones in the sports world very recently. • Lions GM Bob Quinn spoke out against the NFL’s policy of not inviting to the combine prospects with a conviction involving violence or use of a weapon, domestic violence or a sexual offense. Among those not invited to this year’s combine are former Oklahoma running back Joe Mixon, who was videotaped punching a female student in 2014. Quinn is certainly not the only one in the NFL who feels that way. But, it’s important to remember that Mixon is not here because of his own actions. Perhaps it’s unfair to the teams, but it’s not unfair to Mixon.